Deibinson Romero held tightly to a trophy before the sun even began to set Wednesday night. He hopes there are many more of those in his future. 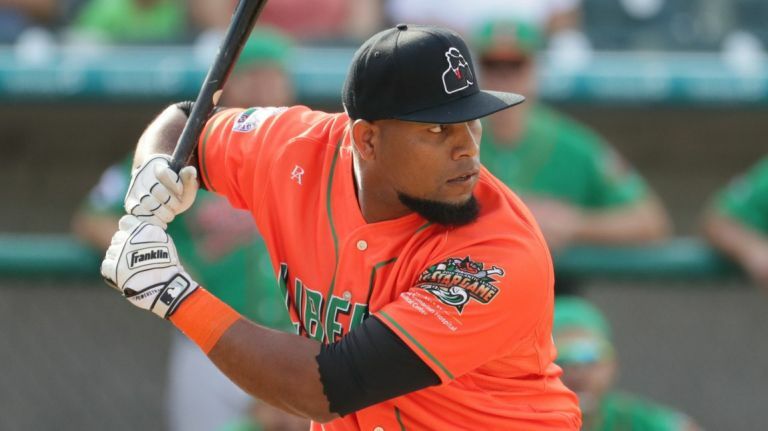 Romero, one of the New Britain Bees’ six all-stars, won the home run derby before the Atlantic League All-Star Game at Bethpage Ballpark in Central Islip. Romero hit three home runs in the final round to beat Duck power hitters Lew Ford and David Washington, who both failed to homer in the championship session. Romero hit five home runs total in the two-round contest, the most by any of the six participants. Participants got six outs to hit as many homers as they could in the first round and four outs in the finals. All three of Romero’s final-round homers came consecutively. He wasn’t hot for long, but he was hot for long enough. Ford won the first round with three home runs. Washington, who has hit some mammoth shots this season, needed a ball to bounce off the top of the leftfield wall and over it to advance past a first-round tiebreaker. Ford is one of seven Ducks who were selected to the All-Star Game and one of four to start. Second baseman Jordany Valdespin, catcher Ramon Cabrera, and pitcher Bennett Parry were the other hometown starters. The home run derby trophy was nice, but Romero would rather have a second-half championship. Managed by former Met Wally Backman, the Bees played well in the first half. After a slow start, they finished 33-30, two games back of the Liberty Division first-half champion Somerset Patriots. The Ducks finished the first half in third place, five games back of the Patriots and three games behind the Bees. With the Patriots clinching a playoff berth because of their championship, it figures that the Bees and Ducks will be playing some pretty intense games down the stretch — both trying to secure a playoff spot. The Ducks won five of the nine games against the Bees in the first half. The Bees will visit Central Islip next week for a midweek three-game series, one that Romero hopes to be walking away from happy. “My team is good right now,” Romero said.